Maryam Maquillage: A GLOSSYBOX for mothers and daughters! A GLOSSYBOX for mothers and daughters! April's "Work That Beauty" theme is all about embracing one's natural beauty and quenching it with feel-good products. Indulge in a No-Makeup Makeup routine, invigorate the skin and be the best you with this month's selection of beauty products. Alterna Haircare Bamboo Style Boho Waves Tousled Texture Mist -- Update your boring, every-day do by flipping the hair over, spraying it from roots to ends and scrunching it up for a tousled, beachy-waves look. Love this stuff! Wash With Joe Coffeemint Invigorating Body Wash -- Cleanses the skin and revitalizes the mind and body with its aromatic blend of coffee and mint. A great neutral scent for men too! Le Métier De Beauté Replenishing Daily Solution -- A super rich, paraben-free formula that conditions, protects, detoxifies and restores the skin's suppleness. This is a great every day solution for people with normal to dry skin. I've tried it before and it's still a favorite! The Honest Company Honest Organic Lip Balm -- Perfect for maintaining happy, healthy lips, this natural balm is packed with organic ingredients like jojoba, Tahitian Tamanu oil rich in Omega 6 & 9, as well as oils from olives, coconuts and sunflowers. You know my lip swatches that you guys love so much? Well, they wouldn't be possible without an organic balm underneath and this one's an instant fave! 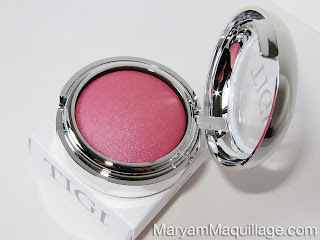 TIGI Cosmetics Glow Blush in Lovely -- my favorite product from the box, this soft baked blush provides a natural flushed glow and looks amazing on all skin tones. The tiniest amount of product is all that is needed to achieve a flawless glow-from-within effect that lasts all day. Just check out my blushing cheeks in the upclose pic! BVLGARI Eau Parfumée au thé Blanc Tea Bag for Bath -- Indulge in the ultimate body bath experience with this elegant and luxurious white tea bag for the bath. Relax the mind, calm the body and enjoy the most luxurious expression of sensory pleasure. Be the best daughter or son and give your mom the gift of Glossybox! This limited edition box has everything a busy mom would want or need and is a terrific, luxurious gift for any mother on her Special Day. Thoughtfully curated and beautifully packaged, as always, Glossybox delivers this generous set of seven versatile items to treat and pamper the most important woman in your life. ColorProof Evolved Color Care CrazySmooth Anti-Frizz Shampoo & Conditioner -- This formula is supercharged with the most efficacious smoothing and color-extending properties available worldwide. Since my mom is not a natural blondie, this shampoo and conditioner set was one of the products she was most excited to try. She had been looking for a great color-proof shampoo / conditioner for some time, so this was the perfect pair to discover in her Glossybox. ColorProof Evolved Color Care products are 100% Vegan, free of glutens, sulfates and salts. Biolage ExquisiteOil Replenishing Treatment -- This versatile serum is infused with Moringa, Macadamia and Argan oil blends, giving instant shine and weightless replenishment to all hair types. My mom is well familiar with Biolage products and had no doubt that this oil would become one of her staples. She dispensed 1-2 drops into her palms and ran the oil through the entire length of her hair to give it a shiny gloss. Estée Lauder Sumptuous Extreme Lash Multiplying Volume Mascara -- A stunning false-lash effect mascara that multiplies the volume of lashes without clumping them together. Not that my mom needs it -- she has the fullest lashes of anyone I know and I'm honestly a little jealous, because she totally failed to pass it on... Anyway. My mom loved the effect of the mascara on her lower lashes, which she said was "the best mascara application ever". She also preferred the travel size, which she claims is a smarter choice over full size, since mascaras have a very short shelf-life. ModelCo Cheek + Lip Tint -- A fresh dose of rosy color for the cheeks and lips. The gel formula is easy to wear and gives a pretty "just pinched" or "bitten" effect. I applied the product to my mom's lips and defined the shape with a lip liner for a more classic look. I also layered the gel to the apples of her cheeks, underneath her foundation, to achieve a natural youthful glow, which she loved. By Terry Creme de Rose -- A nourishing formula enriched with firming, protective and anti-aging ingredients. This delicate cream is formulated for even the most sensitive skin types and visibly plumps the skin in just one use. This cream smells like a divine rose garden and feels incredibly light and luxurious. Another fave on my mom's list! Essie Nail Polish in Geranium -- "I love this color, it's perfect for the summer!" -- was my mom's instant reaction. We immediately painted two coats of poppy-red Geranium over a base coat and finished the gorgeous mani with a top coat. Perfect! "The Perfect Mother's Day Gift"
I LOVE this woman! Can you believe we have a 22-year age gap?! Get Your Glossybox HERE & Sign-up HERE to be the first to hear about the next LE box... hmm... Father's Day, perhaps? Thanks GLOSSYBOX!!! Love what you both got. The products are so different here in Canada, I too just did a post on last months box. Wow, I am surprised that you look so Asian taking into account that you have very European looking mother(there are Russians who look a little bit Eurasian). I am Bashkir with Kyrgiz roots. I actually don't look like my Bashkir relatives at all, but there is something in my features that make me a little less Asian than you. Koreans, Chinese, Thais etc never take me for full blown Asian. For whites with their "one drop rule" I look, of course, Asian or Latino. Thanks for your message! Yeah lol... I look just like my dad (Bashkir). My Bashkir relatives are all very mixed looking -- some are very Asian, others look Middle Eastern, others are more Eurasian. I guess with the Turkic race, one never knows what they're gonna get!! Actually according to anthropologists, there are no full blown Asians among Bashkirs. There are 5 racial sybtypes among Bashkirs - four Caucasian and one Eurasian. Do you you know Russian? Cреди башкир 4 антропологических типа: понтийский, или темнопигментированный европеоидный, южносибирский, субуральский и светлый европеоидный. Наиболее древними расовыми типами местного насeления Акимова считала понтийский и субуральский, а наиболее поздним - южносибирский, который проник на Южный Урал в период Золотой Орды. Кроме того, в юго-восточных районах прослеживаются признаки памиро-ферганского расового типа. My LA Weekend with Dinair! Missha Graceful Muse & Last-Chance Giveaway! Balmain + Zoe Meet Nail Art! Spring Summer Look & Missha GIVEAWAY!! !